Doing the Right Thing is an approach to building meaningful collaboration between the voluntary sector and public bodies. If we collaborate in a local area – with no pre-conceived recommendations about products or providers – then can we help people live better, healthier lives, and can we help the NHS spend its money better? If you would like to find out more about Doing the Right Thing, then please contact Beth Capper (our Head of Programmes) at BCapper@macmillan.org.uk, or Aimie Cole (who provides local programme management) at aimiecole@mac.com. Between us, we have over a hundred year’s experience of working in health and care and lots of evidence we make a difference for the people we work with. But we all talk about what we do in different ways, which can make us difficult to work with as a sector. So we brought our evidence together in a report called ‘Untapped Potential’. This showed collaboration to be crucial to making the most of the voluntary sector, but also found we all - public services and voluntary sector alike - need to get better at doing it. So we decided to invest time and money into figuring out how to make this happen. Over the summer of 2016, we settled on working in Somerset. Doing the Right Thing is essentially a local ‘collaboration of collaborations’, with representatives of the Richmond Group of Charities, wider voluntary sector and public services looking at where we can add the most value by working together. The Richmond Group invested in local and national programme management to scope the collaboration, develop an action plan and bring everyone together, including a National Steering Group. We had no pre-conceived recommendations about what DTRT would focus on, but we all want people to be able to live as well as they possibly can. Prevention quickly emerged as a shared ambition. Toward the end of 2016, we publically signalled our shared commitment to collaborate in the Health Services Journal. One in four people living in Somerset will be aged 65 and over by 2021, something that won’t happen nationally until 2050. Around 44% of people live with a long-term condition, compared with 28% nationally. There is increasing demand for GP services but a reducing number of GPs, with almost a third intending to retire over the next three years. Somerset will have a health funding gap of £600million by 2020/21 if no action is taken. On the plus side, there are 2,800 registered charities in the county, and many more community groups. After a few months of scoping, we reviewed our learning and considered the opportunities for collaboration. Demand for Somerset’s GP services is rising, but the number of GPs is falling. We also know some people go to their GP with problems for which there are no medical solutions, and GPs want to provide support, but don’t always know how to do so. ‘Social prescribing’ approaches (as they are referred to within the NHS and local authorities) aim to build communities and link people with family and friends as well as practical and emotional support from the voluntary and community sector, often via primary care. They are working well, but are only available in a few parts of Somerset. It felt sensible to work as a collaboration to equitably scale social prescribing across the county. With a specific idea emerging, we held a workshop with Somerset residents. They were overwhelming positive about social prescribing approaches. While the collaboration agreed to prioritise community-based prevention, but we also recognised other pressures within Somerset, especially supporting people in and out of hospital. Local community building: Continuing to build and maintain relationships within and across sectors in Somerset​. We used ‘community’ to mean a group of people with a shared interest in people’s health and wellbeing and a commitment to improve it. In practical terms, this was about the local programme manager participating in meetings and events with staff from public bodies and the voluntary sector - bringing people with common interests together. Linking local with national: Acting as a link between partners. An offer from the national Richmond Group teams and National Steering Group to bring their expertise and experience into Somerset, once local leaders confirmed their priorities. In practical terms, this was about coordinating the National Steering Group meetings, facilitating workshops and meetings in Somerset with national experts when these could usefully move work on, and representing Somerset and this work to national bodies, including through conferences and events. Greater involvement of local people, professionals and organisations as we moved from scoping to design. Analysis of the target population for an outcomes-based contract to understand how many people may benefit from this type of service and how best to identify them. Further development of outcome measures that work at both an individual level to understand a person’s story and how best to support them, as well as at a group level to understand what the service is achieving and how to continuously improve it. Building on our work to understand the common components of ‘good’ approaches to developing, establishing and running these services. [This did not include software or associated equipment, as we had not identified the problem technology might solve and were not in a position to write a specification for it]. Developing a business case for an outcomes-based contract that included financial modelling, based on the analysis of the target population, as well as an assessment of viability for investors. In May 2017, Somerset’s Voluntary, Community and Social Enterprise Strategic Forum and Sustainability and Transformation Plan leadership team formally committed to deepen the collaboration to deliver these workstreams. In August 2017 we submitted a joint Expression of Interest to the government’s Life Chances Fund, seeking funding to help us take this work forward. We learned our application was successful in October and received £30,000 of development funding in December 2017. The South West Academic Health Science Network generously matched this grant award. We have now completed a number of research and development projects through the grants from the Life Chances Fund and South West Academic Health Science Network, alongside ongoing in-kind investment from the Richmond Group, Somerset Sustainability and Transformation Plan and Somerset Voluntary, Community and Social Enterprise (VCSE) Strategic Forum. A community research exercise, which focused on exploring the issues that are important to people, professionals and communities in the design of 'social prescribing' approaches. The process used local community researchers to engage with over 100 Somerset residents, mostly face-to-face, and included a survey of around 100 local GPs. An evidence review conducted by the University of West England, which focused on understanding evidence and good practice in a number of social prescribing approaches across Somerset and Devon, and considering these within the context of the national picture and learning from other areas. Data modelling and financial feasibility testing, conducted by OPM (now Traverse), which brought together the findings from the first two strands of work with data modelling and financial feasibility testing of different approaches to scaling social prescribing, including an outcomes-based contract backed by social investors. sustainable funding (for both infrastructure and provision of ‘good stuff’ in communities where it's needed). The potential for using an outcomes-based contract backed by social investors to develop and fund social prescribing was explored. While this approach to financing was judged to be feasible, Somerset's health and care commissioners felt the work would be better mainstreamed and pursued through the new Somerset Health and Care Strategy. On this basis the collaboration did not apply to the next stage of the Life Chances Fund. This work is now feeding into and helping to drive Somerset’s new Health and Social Care strategy 'Fit for My Future', which clearly identifies social prescribing as a top priority and looks to detailed design to develop and strengthen the approach for spreading social prescribing equitably and sustainably in 2019. With the remaining grant funding, work has continued with the local voluntary and community sector to explore the gaps and opportunities for local development and delivery of social prescribing in the areas where it does not yet exist. Three areas have been identified that could especially benefit from developing co-produced and costed plans to deliver social prescribing: Bridgwater/Sedgemoor, Chard/Ilminster and West Somerset. Local organisations Citizens Advice Sedgemoor, Spark and Engage have been commissioned to lead in each of their respective areas. This work will be completed in line with the 'Fit for My Future' timeline. At the same time, we're continuing to explore the capacity and mechanisms that are needed to ensure the VCSE sector can keep overcoming the 'collaboration challenge'. We're collating our learning and conclusions, holding workshops to develop and put in place longer-term ways of working, and are undertaking a technical review of potential mechanisms to enable VCSE collaboration, such as Special Purpose Vehicles and Single Points of Contact. We're focusing on Somerset, but intend this to be useful to other areas. We've collated a lot of learning over the course of Doing the Right Thing and have endeavoured to bring it together in a range of formats that make it easy to use. Our Tapping the Potential report captures success factors for collaboration, considers collaboration challenges, and reflects on what these mean for local and national decision-makers beyond Somerset. More information (including key findings, links to our webinar and webinar summary, and links to the related Twitter conversation) is available here. Collaborating to address health care challenges - a third sector perspective (£). By Lynda Thomas, Chief Executive of Macmillan Cancer Support, in Third Sector News. 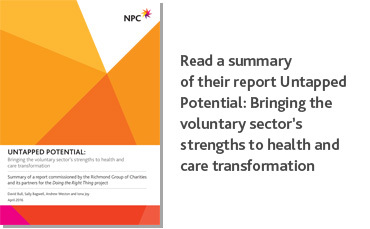 Collaborating with the voluntary sector - an STP perspective (£). By Michael Bainbridge, Head of Primary Care at Somerset CCG, in Health Services Journal. Can charities bridge the health divide? (£). By Dan Corry, Chief Executive of NPC, in The MJ. Collaboration is not for control freaks. By Charlotte Augst, Director of Partnerships at the Richmond Group, on the NHS Confederation blog. Tapping a much greater potential to help the NHS. By Paul Corrigan, National Steering Group member, on the Richmond Group blog. 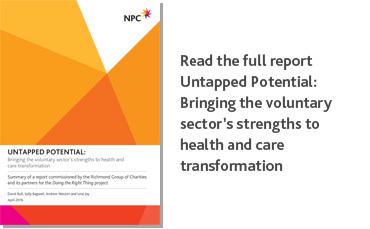 Can the voluntary and community sector lead the change we need in health and care? By Kieron Boyle, Chief Executive of Guy's & St. Thomas's Charity and Jo Bibby, Director of Strategy at Health Foundation. Making a difference to moving in and out of hospital. By Deborah Fisher, Director of Crisis Response and Independent Living (South and Channel Islands) at the British Red Cross, on the Richmond Group blog. Lessons from trying to 'do collaboration' (rather than just talking about it). By Aimie Cole, local programme management at the Richmond Group, on the Kaleidoscope blog. Knitting from the middle out. By Richard Taunt, Part of Kaleidoscope Health and Care, on the Kaleidoscope blog. Embracing place-based collaboration: Lessons from Somerset. By Katie Boswell, Deputy Head of Funders at NPC, on the NPC blog. Our slide deck brings together our learning on social prescribing. The majority of this learning has come from our Doing the Right Thing programme, including our work in Somerset, but we have incorporated relevant learning from our wider work. We talk through this slide deck in a one-hour webinar, which includes 15 minutes of questions and answers. 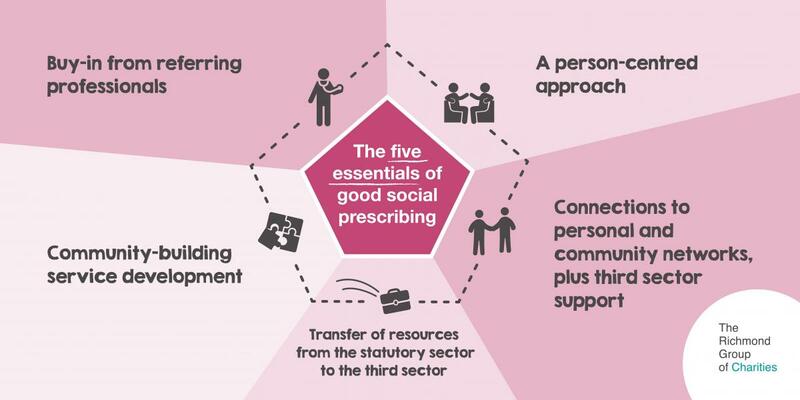 Our 'five essentials of social prescribing' infographic is available for everyone to use. Please feel free to share it, tweet it and add it to your presentations! We have been considering options for outcome measurement within social prescribing, and have collated our learning in a short briefing. We shared our reflections on the NHS Long Term Plan, Comprehensive Model of Personalised Care and what these mean for social prescribing in a recent blog post. Our collaborative work to sustainably and equitably spread social prescribing in Somerset is included as a case study in the Local Government Association's review of Self Care work (pages 23-4). We are also collating learning on social investment and on 'asset-based approaches'. This will be published shortly (likely to be in briefing or blog post formats), but please contact us if you'd like to know more in the meantime. Charles has extensive experience of the NHS in a variety of senior positions in both primary and secondary care, as well as PCTs and Health Authorities. He was Chairman of NAPC from January 2012 to January 2015 and was also Chairman of NHS Clinical Commissioners. In July 2012, he was appointed Adjunct Research Professor at the Ivey School of Business, University of Western Ontario, Canada for the MBA in Health Innovation and in July 2013 was also appointed Adjunct Research Professor in Clinical Neurosciences at the Schulich school of Medicine and Dentistry at the University of Western Ontario, Canada. As an Executive member of the NAPC, which represents the out of hospital sector in the NHS Confederation, Charles is very active in the development of policy in healthcare and internationally, and has been active in advising Governments and international organisations. He also has experience of military medicine until recently acting as Director of Medicine and Clinical Governance for the British Armed Forces in Germany. Dominique and colleagues at the Health Foundation are leading exploratory work around the role of the NHS and health care in improving health. Dominique’s work has focused on improvement methods, networks and user involvement to support change and she helped to set-up the Q community. As well as working part time at the Health Foundation, Dominique also works part time as a Consultant in Public Health Medicine and Quality Improvement in a large teaching hospital, supporting the improvement team to address unwarranted variation. Dominique is a public health doctor and has spent 14 years working in various parts of health care. She is passionate about improving health and care and her interests include population health, quality improvement and clinical leadership and development. Dominique was named one of HSJ’s Rising Stars in 2015. She has also been a Darzi Fellow and Prepare to Lead Alumni. Charlotte came to London in 1997, after completing a law degree in Germany, to pursue postgraduate studies at the University of London. She holds a PhD in law and medical ethics. She now lives in Balham with her British husband and two children. Charlotte has held senior positions in health and research policy for over a decade – in Parliament, for national regulators, and in the charitable sector. She has been a Trustee of Mosaic Clubhouse, a Brixton based mental health recovery charity, since 2015. Bridget has considerable experience of working in health and social care and has held a number of senior management positions in both London and Northern Ireland, covering hospital and community services. As Strategic Commissioner in the Western Board of Northern Ireland she led work on integration of health and social care and commissioning for older people's services. She also subsequently worked on the North West London Integrated Care Programme and has co-ordinated a number of successful integration projects and initiatives. Bridget subsequently worked in Harrow Council in Adult Social Care, leading on Commissioning for Older People Services and Partnerships. Bridget is currently leading a substantive change in the model of Life After Stroke services across the UK, with a focus on Recovery and the development of an Outcomes Framework. These developments are being taken forward in co-production with people affected by stroke and with the support of Stroke Association volunteers. Bridget was part of a team developing the Northern Ireland 20 year Strategy for Health and Social Care and was also Director in the Northern Ireland Telehealth Programme as part of the European Centre for Connected Heath. She was responsible for procurement and implementation of system wide innovation and secured extensive engagement and support across Health and Social Care organisations in Northern Ireland. Bridget joined the Stroke Association as Executive Director for Stroke Support in 2014 and has led the development of the Stroke Recovery model and Outcomes Framework for stroke services. She has completed a substantive restructure of stroke support provision across the UK to enable growth and development of support to people affected by stroke. Beth works to consolidate and increase the impact of the Richmond Group's programmes, including Doing the Right Thing, our programme with Sport England around behaviour change and physical activity, and our programme with RCGP and Guys and St Thomas’ Charity to improve support for people with multimorbidities. In the half of each week that she isn't working with the Richmond Group, Beth is the Director of Operations for the Global Clubfoot Initiative. Beth has over 10 years of experience in health and disability policy for both the charity sector and Whitehall, and has an MA in Social Sciences. Aimie has over 15 years’ experience of working within the private, public and non-profit sectors. In recent years she has managed projects for the UK Cabinet Office on purpose-driven businesses and the Chair of the G8 Taskforce on Impact Investment on recommendations to policy makers. She is also actively involved in the B Corp movement in the UK and a Trustee at a community nursery. From 2007 to 2013 Aimie worked at The Portland Trust – a British non-profit ‘action tank’ with offices in London, Ramallah and Tel Aviv - first as a Project Manager and then as the Director of Projects. From 2003 to 2007 Aimie worked in the UK Treasury in a variety of roles, including as private secretary for international affairs to the Chancellor of the Exchequer, Middle East policy adviser and analyst of public services. Prior to this she worked as a graduate consultant at PriceWaterhouseCoopers Consulting. Aimie has an MSc. in Global Politics and a BSc. in Maths and Spanish and is based in Dorset. Christina leads Nesta’s work on nurturing and growing effective sources of support to improve people’s health and well being. Her current areas of focus include accelerating ideas, creating confidence, health as a social movement, and continuing to make the case for more person and community centred approaches to health. From July 2001 Paul was Special Adviser to Department of Health, first to Alan Milburn and subsequently for John Reid, the then Secretary of State for Health. Over the four years in this post he developed the reform of the NHS and led the creation of NHS Foundation Trusts. At the end of 2005 he became the senior health policy adviser to the Prime Minister Tony Blair, working at the core of No. 10 to continue the development and implementation of health reform policy for the NHS until 2007. Most recently Paul has supported the development of GP Commissioning Consortia with NHS Cumbria and Cumbrian GPs. Before this Paul was Director of Strategy for the London Strategic Health Authority, where he steered the health reform strategy for London written by Lord Darzi. Before joining NPC in 2011, Dan was Head of the Number 10 Policy Unit and Senior Adviser to the Prime Minister on the Economy from 2007 to 2010. He has been Chair of the Council of Economic Advisers in the Treasury, and has worked as a special adviser to the Secretary of State in the Education Department as well as at DTI and DCLG. In 2011 he was a Director in the Economics segment of FTI Consulting. Dan ran the New Local Government Network think tank between 2002 and 2005, which was voted Think Tank of the Year in 2004 and was Senior Economist at the IPPR in the 1990s. He is a member of the Early Action Taskforce, the Advisory Boards for Big Society Capital, Impetus – PEF, and the Centre for Public Scrutiny and is a trustee of 19 Princelet Street and the new What Works Centre for Wellbeing. Stephen is also Chairman of Laing Buisson Ltd, a healthcare market intelligence company, and of its sister company Public Policy Projects Ltd, which provides public policy advice. Ross joined Imperial College Health Partners in 2016 as Director of Strategy. Prior to joining the partnership Ross was a civil servant for 10 years working in a variety of roles, including an advisor on health policy in the Prime Minister’s Strategy Unit and a Principal Private Secretary to a cabinet minister. Ross is a graduate of the NHS Management Training Scheme and has authored policy publications on health inequalities for the World Health Organisation. Norman joined the Red Cross in 1997 as Regional Director and subsequently held a number of other senior positions across the organisation. As the Executive Director of UK Operations, he successfully led a large-scale change programme across the UK in 2016. Norman is also a Non-executive Director with the Northern Ireland Ambulance Service Trust. Prior to joining the Red Cross, Norman had a successful career within the Personal Health and Social Services in Northern Ireland. Liam has played a leading role in many of the major changes that have taken place in the UK’s health and medical research landscape over the last decade. Between January 2007 and November 2009 he was head of the Office for Strategic Coordination of Health Research (OSCHR), a joint office funded by the Department of Health and the Department for Business Innovation and Skills, set up to develop a more coherent strategic approach to publicly funded health research. Before his role with OSCHR Liam spent three years as chief executive of the UK Clinical Research Collaboration and was the first administrative director of the National Cancer Research Institute following 16 years’ experience of research management at the Medical Research Council and the British Diabetic Association (now Diabetes UK). Chloë provides national programme management to Doing the Right Thing. Chloë was the inaugural policy and advocacy lead for health and social care at the British Red Cross. Her advocacy campaigns included ‘Prevention in Action’, which secured amendments to the Care Bill and continues to support local leaders to implement the Care Act’s prevention duties. She was a member of the Care and Support Alliance’s Coordination Board and chaired their Care Act Implementation Group. Chloë was previously a researcher for the International Longevity Centre, where she focused on end-of-life care. She has also worked in local government policy, commissioning and project management roles. She has an MA in the Philosophy, Politics and Economics of Health and was an Honorary Research Associate at UCL’s Crucible Centre for Lifelong Health and Wellbeing. She has been awarded a 2018 Churchill Fellowship to travel to The Netherlands and Sweden to research third sector contributions to 'Buurtzorg' models of care. Fiona leads the LGA’s improvement work in relation to health and care integration, which includes supporting councils and their health partners to find solutions which improve citizens’ health and wellbeing, their experience of care, and system sustainability. She also leads the LGA’s work on NHS sustainability and transformation plans, and on implementating the Better Care Fund, as well as representing local government’s views to national government and partners to influence integration policy developments. Liz has worked in marketing within the telecommunication industry and as a social worker in a large acute hospital and within a neuro-rehabilitation unit. For the last 16 years Liz has worked in third sector development roles including a charity specialising in support to young people with physical disabilities and sensory loss, and nine years as chief officer of a mental health charity. Liz now undertakes a range of freelance work across the south west charity sector including training, interim management, organisational reviews, external evaluation, and supervision for charity chief officers. Liz was a Non-Executive Director of South Somerset PCT from April 2005 until September 2006 and of Somerset PCT from October 2006 until February 2012. She has been a Non-Executive Director of Somerset Partnership NHS Foundation Trust since 2012. She is a trustee and director of SHINE Somerset Ltd, a healthy living centre based in Chard, and a trustee of Somerset Advocacy. Lynda was appointed Macmillan's Chief Executive in March 2015, taking the lead to help Macmillan reach and improve the lives of everyone living with cancer and to inspire millions of others to do the same. Lynda first joined Macmillan in 2001 as joint Head of Media and has played a significant role in transforming the organisation into one of the UK’s most trusted charities. During her first ten years she was promoted to board level as joint Director of External Affairs and helped develop their campaigning arm as well as launching and maintaining their multi award-winning brand. In 2011 Lynda became Director of Fundraising, overseeing the launch of successful new fundraising products and a significant growth in income. In 2014 she was named Fundraising Magazine’s second most influential fundraiser in the UK. Lynda started out her career in communications over 20 years ago, spending the first eight in consumer PR. After becoming a mum, she decided to try something else. She took on a voluntary role at NCH Action for Children that led to a job in the PR and Marketing team. After two years, she moved to the NSPCC as Media Manager, during which time she was part of the Full Stop Campaign launch, before joining Macmillan. Lynda, who lives in north London with her husband, son, two daughters and cockerpoo, is passionate about being part of something which has a positive impact. She’s also a sports fan with a soft spot for Arsenal and is often seen either cycling or running into the office. Mark leads Rethink Mental Illness service delivery in the south of England, with services that span Advocacy, Housing, Registered Care and Community Support. Prior to his role at Rethink Mark worked for Skills for Care. Within this role he worked across the social care and health sectors to provide focus on workforce matters within key strategic drivers such as Care Act implementation. Mark also has experience of working within older peoples housing, care and support services and started his career in social care as a support worker working with homeless families and people with a learning disability. Please note that these case studies have been produced by project partners, using wider information than that assessed by NPC – more information on this can be found below. In each study you will find information about the evaluations and research methods which were fed into NPC’s evidence review – and which were used to allocate the case studies into different categories. The outcome categories for each case study relate to the outcomes which were the focus of the evaluations submitted—not necessarily the full range of outcomes an intervention might achieve. As this information was necessarily limited to information in the documents provided for review, partner organisations have provided supplementary information to give context. These case studies are not, therefore, independent in the same way as the evidence review.